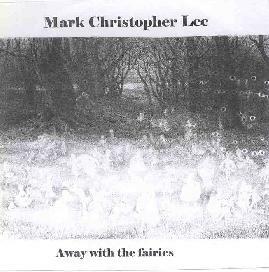 Mark Christopher Lee - "Away With The Fairies"
This is the debut album of former Pocket Gods frontman and Zaam member Mark Christopher Lee. All songs, instruments, vocals, everything, is Mr. Lee. "Away With The Fairies": My wife thinks the vocals are maybe out of key in places but says we should listen to the whole CD first and we shall. Marks playing is adequate, not spectacular, the songs are original, but not that original. On this intro song the vocals are mixed a bit loud. Mark has the ability to lay down an effective vocal track but maybe should be more selective in which one he keeps. This album sounds just what you'd think an English album titled "Away with the fairies" to sound like. Very English folk/psychedelia, very tasteful, arty, not precious. Dropping a tab out in the forest with Syd and Julian Cope and having the wee folk chasing you about with pointed sticks. This guy has listened to Ummagumma a few thousand times. "The Gold of Fairnilee": Yeehaw, country rock, maybe it's English Folk country rock? The playing is fairly primitive but that's not necessarily a bad thing. Rockin tune, gets some Byrdsy twangy Husker Du thang goin. Hits some 1968 Floyd moments with the overdub guitar and keyboard. The drums are a little plodding. A real drummer would help. Spoken word piano bit that cops the Julian Cope line "the sun shone right through". This church organ gets to be a bit much in places. The more bubbly, gurgling keyboard is quite pleasant. I can definitely hear the Spinal Tap influences (I don't know if you should list them as an influence Mark) on the long piano/organ solo, when the little people were dancing around the minature Stonehenge. Closes with the chant of "Away with the fairies"... Debut demo played on BBC Radio, Leeds Raw Talent programme. So I reckon Mark's from Leeds? Track three "Danube": is the most poppy song so far. The vocals on this one work; distorted, effected, aggressive with Lennon/McCartneyesque back up vocals. I almost hear some Rutles moments on this one. The poppy part stops and goes off the deep end into Jazz Odyssey territory. I would prefer to hear more of Mark's Popul Vuh influences... "Who are we, just flowing in the currents... there is no end only life". Great lyrics, cool Beatle La La La's. "The Golden Bough": Starts with some Ground Control to Major Tom strumming, some occasional vocals, sounds pretty cool when the lead guitar? comes in. Is he singing "King of the world?" Goes into solemn church organ piece, reciting vocals "the priest who slew the slayer..."
"Lust": Very Beatleish, poor guy has a flat voice in places, sounds fine in other places. Nice poppy uptempo song... nice instrumental part, is that a xylophone? Spoken word Barrety "water flowing underground". It's hard to say how a one man band sounds different from a "real" band but they always do. The whole CD reminds me sound-wise of the slew of mid 80's four track Tascam demo tapes. It was probably recorded on a computer and really does have a much cleaner, full sound than Tascam tapes. Overall this is a nice, tastefully done CD, English/hippy/psyche/art pop with much attention to detail. It's not a silly deadhead hippy thing. For the genre this CD is a notch or two above. For more information you can email Mark Christopher Lee at: thejacula@hotmail.com.